We’ve reached the most important point in my life which is followed by the most important watch I have in my collection so far. During the years I’ve become a huge sucker for watches from my year of birth and it’s something that I’m constantly on the lookout for. To me it’s something special to have a timepiece on your wrist that I know have been ticking for just as long as I have been drawing breath. It’s like you’re on the same level somehow. Like a lifelong companion that won’t let you down as long as you look after it. My first concern back in the winter of 2013 when my wife announced that she was pregnant was which watch to buy for our firstborn. I had of course gone through this matter in my mind many times before so I already had a couple of options to evaluate. I figured there was two different ways to go. I could either go with something that represented the year of 2014, like a new release from that year, or I could go with something classic that could have been bought whenever. I came to the conclusion that what mattered to me the most was that the date printed on the certificate and receipt was going to match the date of birth. My decision finally fell on a CWC quartz diver with day and date display. I figured it had a classic look and was built to last. To me it’s a watch that can be used anywhere and for anything. CWC also happens to be one of my favorite brands which of course also played a big part in my decision making. In early 2014 I called up Silverman’s in London, UK, to see how we could arrange this. I got to talk to a gentleman by the name Richard and I explained to him the matter of how I wanted to buy the watch but not until my baby was born to make sure all paperwork was going to be made out on the actual date of birth. “No problem” Richard told me “I’ll just lay it away”. I clarified that the baby wasn’t due until August and that it would take a while. “Don’t worry” he said “We'll hold the watch for you. Just call me when it’s time and I’ll take care of all the details”. My son was born 2:53 am (a great hand position btw!) to a Saturday morning in August 2014. I was wearing a Rolex Datejust 16233 when I got to hold him in my arms for the first time but that's another story. When we later woke up after getting a couple of well-earned hours of sleep I got on the phone and called up Richard. “Congratulations!” he said “I’ll put the name and the date of birth of the certificate and will ship it out ASAP”. Talk about customer service! #235 - The CWC Quartz Diver Day/Date on the wrist of a very proud dad. I've literally taken hundreds of pictures when wearing this watch so I had plenty to choose from. Below follows only a few from different moments were it have accompanied me. 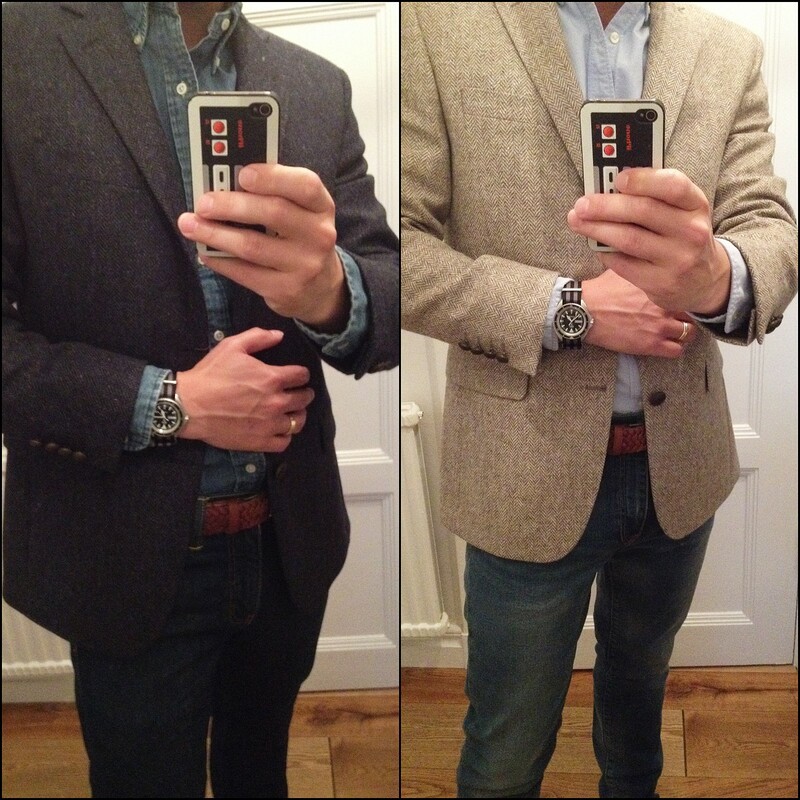 Two new jackets that went well with the watch. I would estimate that 90% of all my watch pictures are taken while commuting to work. Either on the bus, the subway, the train or while waiting for any of the three. Given photo opportunities! Waiting for the bus. A classic! Fooling around with the copy machine at the office. I probably don’t have to mention that this is one of my few keepers but perhaps it’s best for the record to confirm that this watch will never be sold. I haven’t really decided when I’m going to give it to my son but he will of course get it someday. Meanwhile I’m using it every now and then, not afraid of giving it a few battle scars so that he in the future always can carry some memories of his dad with him wherever he goes. I mainly wear it when I go fishing but I also wear it every now and then just because I love it so much. It really is a fantastic watch. The first picture I took with my new iPhone 5S. On the subway on my way to the office. Having my second child coming up in a very near future you might think I’ve already planned what watch I will get for him or her this time but I actually have no clue. I have of course considered sticking with the CWC theme but unfortunately they have no dive watches with the T-dial left and I’m a little allergic towards the new L-dial. I’ve been thinking about getting a Seiko and perhaps go with the other option this time and buy something that will represent 2017. I recently saw that there will be a pretty cool re-issue of the old Samurai being released in February/March and might go for that one. We’ll see. You’re going to find out eventually. Gave it a try. Didn't like it. According to my Instagram I was listening to Huey Lewis & the News when I took this picture. Great stuff! Pike fishing in October 2016. Yet another picture taken on my way to the office. If you haven’t started to look for watches from your birth year yet but think it sounds like a fun thing to try I would recommend you to start with Seiko. The year (and even month) they were built in is super easy to identify thanks to the logical structure of the serial number and if you are lucky you might even manage to pinpoint them both. I'm still struggling to do just that and it has really become a challenge. On my way to a wedding in Katarina Kyrka, Stockholm, Sweden. The CWC made it on to the wrist and worked just fine for a dressed up occasion.